As a big boy who sometimes feels like a tamal in certain clothes, I often seek out a healthier version of traditional Mexican dishes. I want all the flavor, but realized I need to make smarter choices in the preparation and ingredients. I developed this recipe for Green Chile Enchiladas with Nopalitos and Mushrooms to satisfy my craving for something that tastes like a pure indulgence, but I can feel better about eating them. Why are these a lighter version? First, I swapped out the shredded beef I typically fill my enchiladas with and added a good amount of meaty vegetables instead. In the preparation, I do not fry my tortilla before dipping it into the sauce and I use a good quality low-fat cheese. Honestly, you wouldn’t even know the difference. As you will see, there is no added salt. No need with all the spices and chiles. The result? Deliciousness! Even some of the toughest critics in my household LOVED the enchiladas and want me to make more. Preheat oven to 175 degrees and grease a 9” rectangular baking dish with Canola cooking spray. 1. In a medium-large frying pan, heat the olive oil on medium high flame. Add the onions and sauté until slightly translucent, about 2-3 minutes. Add the garlic, nopalitos and mushrooms. 2. Sauté the vegetable mixture until the mushrooms soften, about 5 minutes. Season with red pepper flakes and black pepper. Add ¼ cup of the Herdez Tomatillo Verde Sauce to season the vegetable mixture. 3. In a small frying pan, warm about ½ cup of the Herdez Tomatillo Verde Sauce and warm over medium heat. Dip a corn tortilla in the sauce and move to clean work surface or the baking dish. 4. Place a heaping 2 tablespoons of the nopal and mushroom mixture in the tortilla, along with 1 tablespoon of the shredded cheese. Roll and place in a baking dish. Repeat until all of the tortillas are filled and rolled. 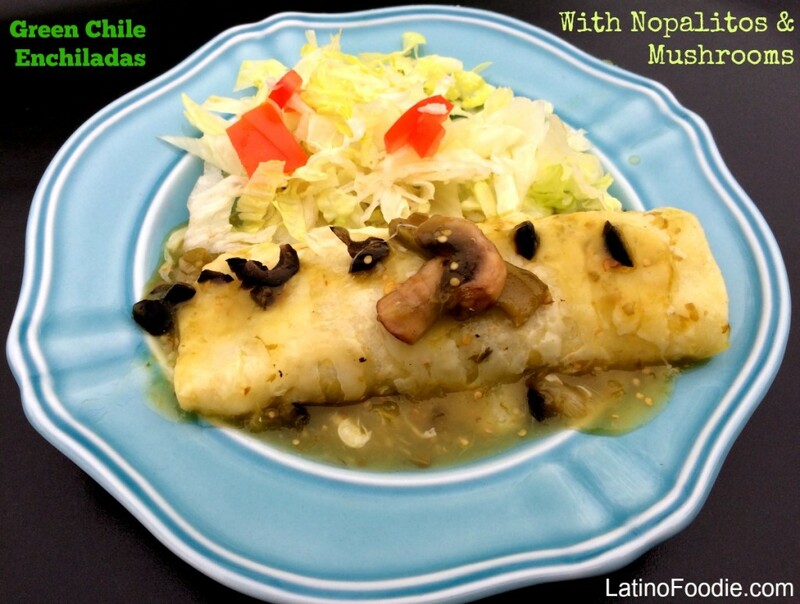 Pour the rest of the Tomatillo Verde sauce over all of the rolled enchiladas. Sprinkle with more of the shredded cheese. Place a few black olives on each enchilada depending how much you like them. Art doesn’t like black olives so I have to use them sparingly. 5. Bake for 30 minutes. Allow to rest for about 5-10 minutes. Garnish with chopped green onions and serve. We like ours with a nice green salad and a side of frijoles. This is a sponsored post with Herdez brands, but all opinions are my own. We thank you for supporting the brands who sponsor LatinoFoodie and allow us to continue to develop delicious recipes like this one above.